Infinitely qualified and smartly entertaining biographer Todd (Albert Camus, 1997, etc.) sifts through the mythic life of the French novelist, Nobelist-manqué and supreme political chameleon. 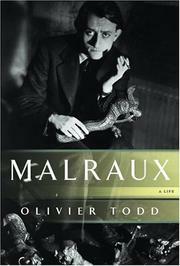 Throughout this marvelously enjoyable life-as-a-novel, Todd continuously circles the question: Who was André Malraux (1901–76), really? High priest, trafficker in stolen goods, genius, dope addict? From early on, as the son of a suave banker-engineer and a baker’s daughter in the Parisian suburb of Bondy, Malraux “wielded a weapon: a dark beauty and magnetism that could make an impression of familiarity or shamanic intensity.” Tourette’s syndrome burdened him with uncontrollable tics but didn’t impede his relentless, autodidactic ambitions as he morphed from Parisian rare-books broker, publisher, and early protégé of Max Jacob’s to intellectual and literary gadfly. His marriage to the German-Jewish heiress Clara Goldschmidt, who lent intellectual direction and emotional grief to his entire life, prompted restless travel to Asia—travel that would provide fodder for Malraux’s fiction. His epistolary essay Tentation de l’Occident garnered attention and a job with publisher Gallimard; his debut novel, Les Conquérants, proved the “first good roman engagé of the decade,” opines Todd cockily; the third part of his fictional Asian trilogy, La condition humaine, won the Prix Goncourt in 1933. At first a lukewarm communist and supporter of Trotsky, Malraux later led the French vanguard to the Soviet Union and staunchly praised the system. His personal involvement in the Spanish Civil War, organizing a squadron and gathering munitions for the Republicans, resulted in L’Espoir, considered by Todd (and many others) his best novel. By WWII he had battled with the Alsace-Lorraine Brigade and been duly decorated. Yet it was through his work as propagandist for Charles de Gaulle that Malraux assumed his power as crusader for High Art—“the supreme weapon against Death,” he declared. Todd, by turns elegant, sarcastic, disdainfully well read, pounces and plays with his hide-and-seek subject, writing in the present tense: The result is delightful reading. Dashingly brilliant, irreverent and very intimidating treatment for our French intellectuals.